Although I have been a Mets fan since 1975, I seldom focus specifically on the Mets in this blog. Tonight, however, please allow me to indulge myself. This post is not meant to imply that the Mets should take a specific course of action regarding Wright in this, the final year of his current contract with the Mets. These are just the facts. Let them speak for themselves. David Wright factoid #1: At age 29, he is already the Mets all-time leader in career Off. WAR: 38.2. David Wright factoid #2: When he scores his 37th run in 2012, he will become the Mets all-time leader in that category. David Wright factoid #3: His 171st hit this year will make him the Mets all-time career hits leader. 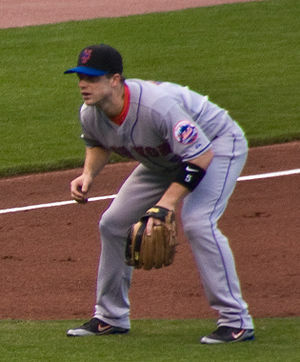 David Wright factoid #4: He is already the Mets all-time leader in Total Bases: 2,112. David Wright factoid #5: He is the Mets all-time leader in career doubles… by a wide margin with 281. Next closest is Kranepool at 225. David Wright factoid #6: With just 9 more RBI, Wright will surpass Strawberry as the Mets all-time career RBI leader. David Wright factoid #7: With just 46 more walks, Wright will also pass Strawberry as their all-time leader in that category, too. David Wright factoid #8: Wright’s career OPS+: 134, is the same as HOF’ers Al Kaline, Paul Waner, and Joe “Ducky” Medwick. David Wright factoid #9: Wright’s 825 Runs Created is the most in Mets history. Jose Reyes, by way of contrast, created 706 runs. David Wright factoid #10: With just 19 more Extra Base Hits, Wright will become the first Met to reach 500 career Extra Base Hits. I know he’s great, but I had no idea he was so high up in all those categories. Wow. Is Wright then the best hitter in Mets history? Besides the Straw man, who else is there? Piazza maybe, but not being a fan, there’s no one else who comes to mind as a really first-rate Mets hitter. Hi Arne, As of right now, I would give Strawberry a slight edge over David Wright, but a strong year this year from Wright would put him solidly in first place as the Mets all-time best position player. People forget, though, how good Strawberry really was in his first 8 years as a Met. I went back and did some research on all the Mets best position players, and what’s surprising is that NONE of them ever played as many as ten years with the Mets. So that’s a big part of why their career totals are so comparatively low. Beltran, also unfairly maligned by Mets fans, had a very solid 6.5 year run. Piazza played with the Mets longer than I thought, 8 years, vs. just 6 with the Dodgers. Piazza’s numbers with the Mets are also good, but some of his very best years were in L.A. Thanks for the mention on your website, Paul. Nice read. It’s amazing that Wright could take the lead in almost every single offensive category in Mets history. It would be a shame to see him leave. Billy, Thanks for reading. I agree, I would hate to see him leave, too.